PSX Spyro the Dragon (USA) in 41:38.3 by lapogne36. Gnasty Gnorc is mad at the TV, since a reporter said he's not a threat and ugly. Because of that, he decided to trap all of the dragons in crystals. Only Spyro is spared, and he has to free them all. 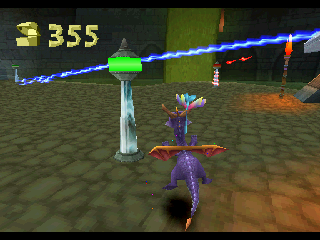 The author, lapogne36, helps Spyro complete this task as fast as possible by exploiting glitches to boost his speed. You can learn more about this glitch by reading the author's comments. The author has also done a run for the next game in the series.